The Solar Yoga Center is a non-profit, educational, non-discriminating institution established in 1970. All yoga instructors donate their time without financial compensation. 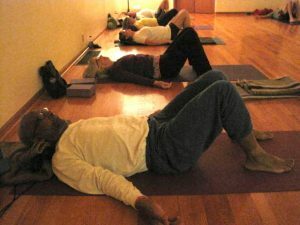 Informal Meditation is held 11:00 a.m. to 11:30 a.m. on Saturday after the Yin focused class. Sunday Sangha, a Mindfulness Meditation Sitting Group, meets Sunday mornings from 11:00 am to 12:30 pm for silent meditation and discussion on topics related to Insight Meditation, Mindfulness Practices and Theravada (Early Buddhist) teachings. Chairs are available, but if you prefer a cushion, please bring your own. New and experienced meditators are welcome. Study Group meets upstairs on Thursday at 7:15 pm. Jaime leads the group in yogic studies and meditation. The philosophy of Grupo Axé Capoeira is to respect all the mestres, preserve the roots and traditions of Capoeira, and train Capoeira in all its aspects: as a fight, art, and culture. We endeavor to teach and educate so that capoeira will grow in a positive healthy way. We attempt to pass on to the students physical and mental methods of training so that they learn to create situations and maintain a dialogue within the game. By playing both with friends and enemies, students learn to deal with any situation in or out of the roda. In North America, we not only teach movements, but the Brazilian language and customs as well, so that the students may become true capoeiristas. For more information, visit the Grupo Axé Capoeira St. Louis website: www.axestl.com.